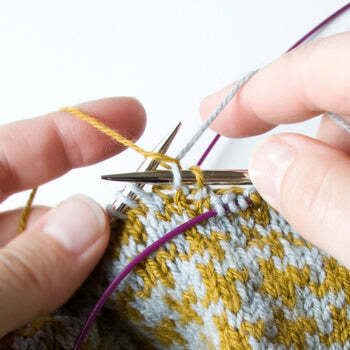 Have you noticed a lot more people knit holding the yarn in their left hand? 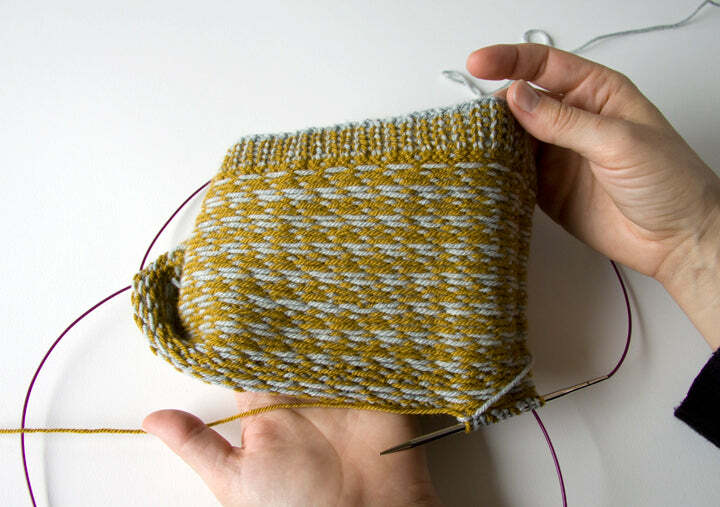 So many people have found the advantage of Continental knitting for stockinette in the round. It's very fast. I'm an English knitter, but I have adopted Continental for straight knitting (I still purl English though). The other place it's very useful is in stranded knitting with two colours. I used to drop colour A, pick up colour B, work colour B, drop colour B, pick up colour A, etc... And I used to do a fair amount of colour work. (I posted very briefly about an old project here, which combined intarsia and stranded). Now I combine Continental and English for faster knitting and better tension. 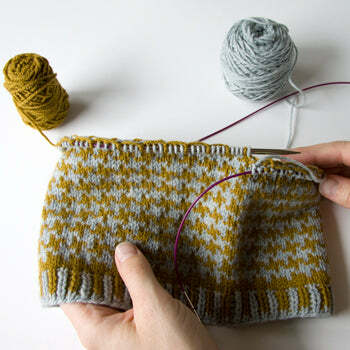 Arrange your knitting with one colour on the left and one on the right. You should always keep each colour to the same side. For example, in this project, I keep the mustard colour on the left and the blue on the right. 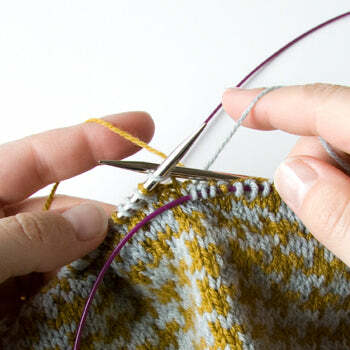 Get your stitches arranged on your needles and ready to knit before picking up your yarn. Once you're going, it's kind of like riding a moody horse: you don't really want to drop the reins.Then arrange the strands: Continental on the left, English on the right. Then, just knit as usual. The first time you do this, it feels strange, like playing tennis with a racket in each hand (notice all my sportswoman analogies today?) But once you get into the swing of it, it's almost as fast as regular stockinette.In this example, I'm showing a small pattern repeat, where you don't have to catch the floats. That is a tiny bit more complicated, and I'll have to cover that in another post. And just for fun, here's the reverse. I find it's much easier to keep my tension even with two handed stranded knitting.